London, UK 14 January 2018 – Photographer Dale M Reid of Canada was Awarded Honorable Mention in Fine Art for the winning entry Elegance Calla Lys Noir 2 at prestigious Monochrome Awards honouring Black & White Photography. The 2017 Monochrome Awards received 8942 submissions from 87 countries around the world. Los Angeles November 14, 2017 – Professional photographer Dale M Reid of Canada was presented with the 12th Annual Black and White Spider Awards Honorable Mention in the category Still Life at a prestigious Nomination & Winners Photo Show streamed Saturday October 14, 2017. The live online gala was attended by over 11,000 photography fans around the globe who logged on to watch the climax of the industry's most important event for black and white photography. 12th Annual Jury members included captins of the industry from The Armory Show, New York; Christie's, London; McCann, Singapore; GQ, New York; Hot Docs Film Festival, Toronto; Y&R, Malaysia; Sharon Calahan, Pixar Animation Studios, Emeryville; Bloomsbury Auctions, London; and Donald Schneider Studios, Berlin who honored Spider Fellows with 672 coveted title awards and 1034 nominees in 31 categories. "Spider Awards 2017 proves once again to be a great challenge for the jury to select the best images of the year. Evry year this photographic competition increases its quality of content, reputation and prestige" said juror Angrea de Polo, Cultural Heritage Consultant at Fratelli Alinari Photo Archive in Florence. Curator and Arts Writer Paola Anselmi added "Congratulations to all the winners. A great deal of humanity and soul in this year's selection, maybe it is a sign of the times a promise for future awards and photography in general" "A truly amazing set of entries, so many deserving winners," added Marcel Wijnen, Creative Director at Anthem Worldwide. "It's an incredible achievement to be selected among the best from the 8,121 entries we received this year" said Basil O'Brien, the awards Creative Director. Dale M Reid's "Oyster Mushroom 37", an exceptional image entered in the Still Life category represents black and white photography at its finest, and we're pleased to present her with the title of Honorable Mention." Photographer Dale M Reid uses dark room techniques to imbue her botanical subjects with unimaginable personality and emotion. Reid's studies utilize different elements to produce sensual and whimsical portraits in high contrast with a keen eye for texture, form, and framing. Elegant white or black backgrounds highlight her subjects, allowing them to monopolize the photographs, filling the space with their unique voices and stories. 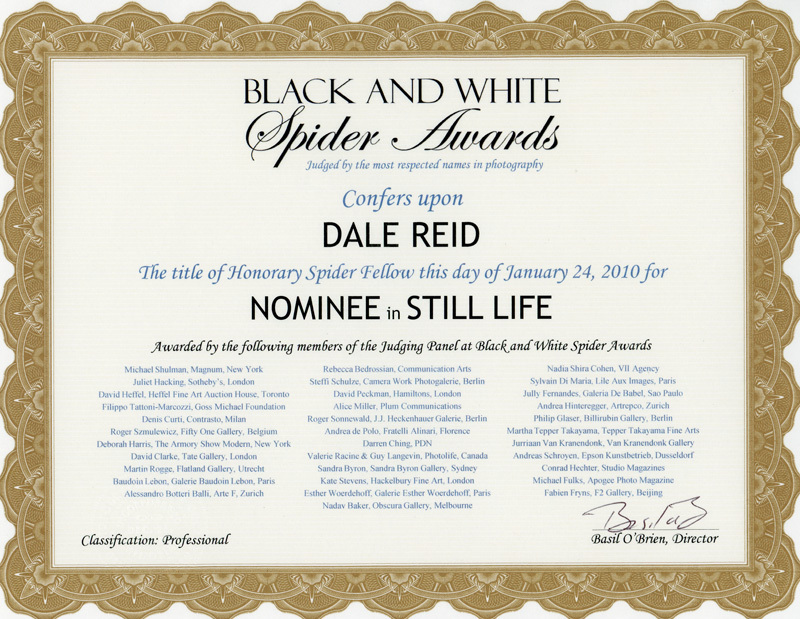 Los Angeles November 5, 2016 – Professional photographer Dale M Reid of Canada was presented with the Annual Black and White Spider Awards Nominee title in Fine art and Still Life at a prestigious Nomination & Winners Photo Show webcast Saturday, November 5, 2016. The live online gala was attended by over 10,500 photography fans around the globe who logged on to watch the climax of the industry's most important event for5 black and white photography. 11th Annual Jury members included captains of the industry from National Geographic, Washington, DC; The Armory Show, New York; TBWA, Paris; Victoria Film Festival, Canada; Aeroplastics Contemporary. Brussels; Studio Hansa, London; Fratelli Alinai, Florence; Australian Centre for Photography; Young & Rubicam, Lima; and Anthem worldwide/Marque Branding, Sydney who honored Spider Fellows with 627 converted awards and 951 nominees in 31 categories. "It is an incredible achievement to be selected among the best from the 7,556 entries we received this year," said Basil O'Brien, the awards Creative Director. "Morning Reflections in the Fine Art category; and Can I Join In and Oyster Mushroom 27 in the Still Life category, represents black and white photography at its finest, and we're pleased to present her with the title of Nominee." Jury member Paola Anselmi, interdisciplinary curator and arts writer in Australia added, "As always it was a real treat to be part of the program. Congratulations to all involved and to all the remarkable photographers who gift us new insights into the world and ourselves." "A truly amazing set of entries, so many deserving winners," added Marcel Wijnen, Creative Director at Anthem Worldwide. Liz Daly published a review of the Dejeuner exhibition at NAWA Gallery in New York City. » » Click here to read the review. Los Angeles November 21, 2015 – Professional photographer Dale M Reid of Canada was presented with the 10th Annual Black and White Spider Awards Nominee title in the category of Still Life at a prestigious Nomination & Winners Photo Show webcast Saturday November 21, 2015. The live online gala was attended by over 10,000 photography fans around the globe who logged on to watch the climax of the industry's most important event for black and white photography. "It is an incredible achievement to be selected among the best from the 7,686 entries we received this year," said Basil O'Brien, the awards Creative Director. "Dale M Reid's five photographs, were exceptional images entered in the Still Life category, represent black and white photography at its finest, and we're pleased to present her with the title of Nominee." Jury member Diane Ruggie from Velocebella agency added, "The gallery of winners and runners up has true stopping power." "Initially, the focus of Dale M. Reid's photography was related to landscapes (maritime, urban and seascapes), along with floral studies and still life. During the past four or five years, her subject material has switched to floral studies and still life shot in the studio. In the still-life category, her recent series is the "Oyster Mushroom. Due to the shapes and textures of the oyster mushroom, these images are more abstract and interpretative, she said. 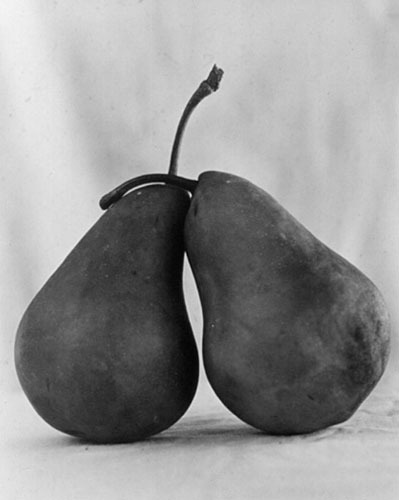 "I also shoot pears and the feel of those images tend to be whimsical, such as 'pears dancing in the rain,'" and more. Reid, a transwoman who lives in Toronto, will bring her work to the Windy City for the 14th annual One of a Kind Show and Sale Chicago, set for Dec. 4-7 at the Merchandise Mart. Reid joins more than 600 artists from across North America to showcase their imaginative, handmade creations." "It is an incredible achievement to be selected among the best from the 8,508 entries from 73 countries that we received this year. Your six exceptional images entered in the Still Life, Professional category, represent black and white photography at its finest and we are pleased to present you with the title of Nominee." Click here to view the winners and nominees in the Still Life, Professional category. The awards international Jury included captains of the industry from The Royal Photographic Society, FoMu Fotomuseum, Aeroplastics Contemporary, Torch Gallery, Stockholm City Museum to Fratelli Alinari in Florence who honored Spider Fellows with 298 coveted titles awards and 957 nominees in 14 categories. You can view the 9th Annual Winners Gallery at thespiderawards.com. Black & White Spider Awards is the leading international award honoring excellence in black and white photography. This celebrated event shines a spotlight on the best professional and amateur photographers worldwide and honors the finest images with the highest achievements in black and white photography. Despina Tunberg (Art Director of WWALA) has published a review on the World Wide Art Los Angeles website about my October 2014 show. Late last year, I was invited to have ten images from my mushroom series featured in the Spanish magazine 'arte fotografico' along with thirteen other international photographers. This edition of the magazine features still life images. This is a true honor and represents another significant development in my photography career. » » Click here to download the exerpt from arte fotografico. I am pleased to announce that at the 8th Annual Black & White Spider Awards ceremony held October 19, 2013, I was honored with six nominations -- the most in the Still Life, Professional category. From the 9,456 entries received from 75 countries, my work received a high percentage of the overall votes, marking the third time that I have been recognized at this prestigious event. Click here to view the award. Black & White Spider Awards is the leading international award honoring excellence in black and white photography. This celebrated event shines a spotlight on the best professional and amateur photographers worldwide and honors the finest images with the highest achievements in black and white photography. The Awards Jury represents the industry's biggest names and tastemakers, from TATE, NATIONAL GEOGRAPHIC, FRATELLI ALINARI, THE ART NEWSPAPER, CHEIM & READ of New York and more, who reviewed the entries online before making the nomination shortlist and honoring 246 title awards and 938 nominees in 14 categories. Images are judged on the basis of artistic merit, originality, subject and style. Click here to visit their website. Food has inspired artists for centuries. And lately, as food as become a hot topic on TV and in pop culture in general, it also seems to be more prevalent in the art world. So it should come as no surprise to find plenty of gastronomically inclined pieces on offer at next week's Affordable Art Fair. From photographs of mushrooms resembling tangled clumps of human bodies to colorful triptychs of ingredient pairings, the fair features art that will help you replace that college-era poster still hanging on your kitchen wall. Read more click here. Serafin writes: "Sometimes it seems that anyone can call themselves a photographer these days, armed with digital cameras, high resolution printers and some basic Photoshop ability. But skills like composition, lighting and perspective can't be replicated by computer software and still serve to set the trained artist aside from the dabbling hobbyist." Read more click here. When did you start doing photography? "Photography has been a part of my life for over 30 years and it was a hobby that I initially had. In 1999, I started looking at it as an art form and started developing it into a second career and 5 years later took the plunge to make..."
March 21, 2011. Artwork has been reviewed on NY Metro art scene blog. "We entered through the Artists Project and talked at length with a few artists that caught my eye. The first being Dale M.Reid from Toronto. It was her dancing pears in the rain and her florals that enthralled me. The stark black and white imagery suits my liking." Click here to read more. I am pleased to announce that at the 5th Annual Black & White Spider Awards, I was honored as a nominee for the category Still Life | Professional for my Pear Affair #2 image. This was a first time submission. While the image did not make it to the winners section, but to see my work included amongst top international photographers is one of the highlights of my photography career. To view the Still Life \ Professional nominees please click here. 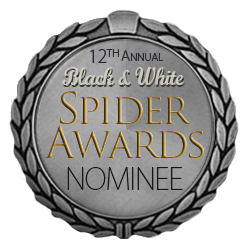 Click here to see the Black & White Spider Award certificate. Black & White Spider Awards is the leading international award honouring excellence in black and white photography. This celebrated event shines a spotlight on the best professional and amateur photographers worldwide and honors the finest images with the highest achievements in black and white photography. Thousands of images are submitted each year with only a few hundred images making it to the Nominee status by consensus of the Jury. The Nominee shortlist consist of images that have received the highest percentage of votes overall and is the shortlist from which the winners are decided. The nominated photographers were selected by a who's who Jury Panel from the international photography community, including Tate Gallery (London), Sotheby's (London), Magnum Photos, The Amory Show, Hamiltons (London), Galerie Baudoin Lebon (Paris), Photo Life Magazine, Fratelli Alinari Photography Museum (Florence), and Sandra Byron Gallery (Sydney). You can view the 5th Annual Winners Gallery at thespiderawards.com. "... returning artist Dale M. Reid spoke about her distinctive black and white photography in an artist demonstration at the Studio... These animated and dynamic compositions of pears, flowers and captured moments in the urban and natural landscape defy the restraints of tone to embrace a full range of values." View the full article and slide show online. Downloadable *.pdf click here. CBC National News story 'A Tale of Three Lives'. I was featured along with two other women that left the corporate world to pursue their passion. "Probably wouldn't remember me from the Javits Center, but I will never forget you. You are so lovely and your talent, well there are just not enough words to express. I was so taken by your pears as my husband said your favorite fruit. After inquiring how you came up with the concept, I was even more in awe. Not to mention the roses, well..."
"Dale Reid is a beautiful photographer. I love the way that she is able to dodge light in the darkroom to obtain the purity of the white seen in the cloud of fog floating over the hidden trails. The white tulips on a black background are not only classic they are breathtaking The 2 hugging pairs depict a warm embrace. The light captured upon the boats glimmered in the mist. Dale is a true Photographer. One that is able to see the beauty that appears in the chemical bath as they wash into focus. The depth that Dale is able to capture is reminiscent of Ansel Adams. Thank you for sharing your gift with me." "I am finding your images unforgettable. They have stayed in my consciousness with their beauty, their playfulness, the elegance of your vision." "I was stunned when I passed your booth at The One of a Kind Show. Stunned by the beauty I saw. You take a simple pear and turn it into something that is truly beautiful. I was captivated and each piece told a story. The poise of each object gave it a character, and attitude and a personality. The object of your vision took on life and with such gave the viewer a story. I was not only inspired to pick up my old 33 mm Canon camera and to get back out there and starting taking pictures of what I saw as beautiful, but to share a piece of me. A picture can move mountains, yours move the world! " "It was great seeing your work. Of all the pictures we saw, yours was the most inspiring both from a composition and technical point-of-view. I wish you much success." "A pleasure to have the honour of your comments. As an artist you have a vision and passion. My favourite is Liberty Street - View 1 - the lighting you have captured is outstanding." "Always an adventure seeing your work." "As host of Muse 08 Carnivale, our 9th annual silent art auction in support of Sunnybrook Health Sciences Centre, New Leaders of Sunnybrook Foundation owes a great debt of gratitude to community-minded individuals like you for making it possible to leave an impact on healthcare excellence. Your invaluable contribution of your artwork has helped us to make an investment that will improve the quality of life we enjoy in Toronto."